so since the ninningers have the week off .... lets talk about a Vs movie! what potential plot would you like to be the set up, and which team should they battle? #1 - hired to break into a samurai castle to steal ancient treasure. you guessed it! the shiba clan's castle and we have a samurai vs ninja flick. or, if thats too easy same idea but instead a sealed away castle, and boom magiranger! #2 - breaking into science research labs. this opens possible vs with gekiranger, abararanger, and megaranger. 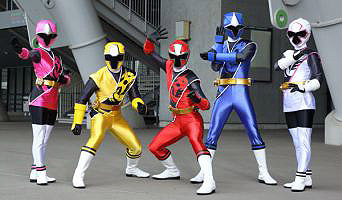 hell if they villian is from space add some dekaranger too. #3 - they are asked to stop a rampaging monster, however, this monster is no ordinary monster ... it's in fact a new spirit animal and BOOM! gaoranger! thats all i got but would like to hear some of your ideas too! remember this is just for fun, and if anything could make you think about which past sentai members you could have beat up takaharu. Your first idea sounds the best. Especially because they both have over the top golds. well, i'd like a Shinkenger vs Ninninger movie because i recall reading or hearing that ninja and samurai were something of natural enemies. was magishine over the top too? i havent see magiranger yet. I was meaning Shiken Gold being over the top. ha! yeah he was very flashy for that otherwise subtle team.